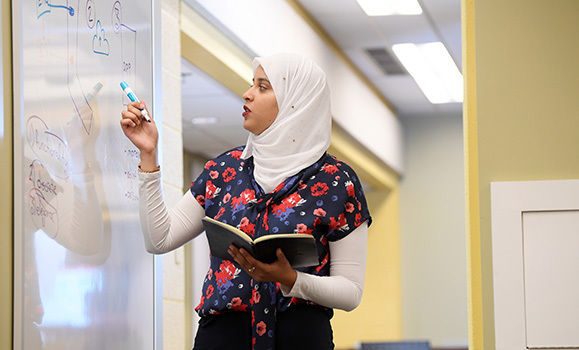 When Hayam Mahmoud-Ahmed started in Dal’s first-year Integrated Science program, she was planning to major in Microbiology and Immunology. Those plans changed — but thanks to the interdisciplinary nature of the program, it wasn’t long before she found a new focus. She’s referring to Jennifer Stamp, senior instructor in the Department of Psychology and Neuroscience — and it wouldn’t be the last time the last time that she found influential mentors in her Dal experience. For her Integrated Science research project, she worked with Antoine Tremblay, a researcher in the NeuroCognitive Imaging Lab. She really liked it so she started volunteering at the lab and decided to major in Neuroscience. Through her work at the lab, Hayam met Aaron Newman, director of the RADIANT (Rehabilitative and Diagnostic Innovation in Applied NeuroTechnology) program who told her about their Neurotechnology Innovation, Commercialization and Entrepreneurship (NICE) course. And the opportunities have flowed from there. To complete the NICE course, Hayam had to take classes in Computer Science and Management. She did really well in the Computer Science class and discovered she enjoyed it — so much so that she decided to add Computer Science as a second major to her degree. 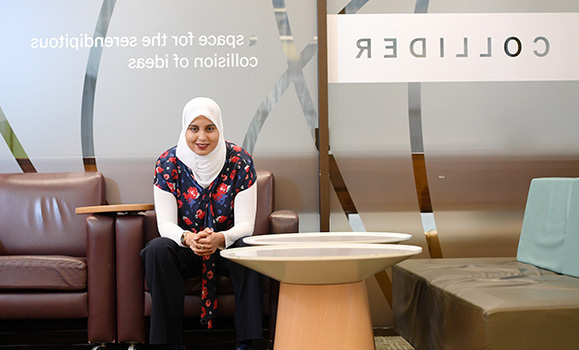 The Management class she chose introduced Hayam to Mary Kilfoil, acting director of the Norman Newman Centre for Entrepreneurship and who initiated Hayam in the world of startups and innovation. All these different pursuits came together in the NICE course project she took on with two other classmates: developing a device that would help retrain muscles for individuals who have experienced a stroke. “During the class, we had this pitching night where everybody just throws out an idea and we vote down to the top four. One was an exoskeleton and I wanted to do that because I wanted to actually build something,” she explains. “When we talked to a physiotherapist in the School of Physiotherapy, he didn't bash the idea but he gave us a different idea using electrical stimulation. Because the parts she needed didn’t arrive until the day before the demonstration, Hayam had to build the prototype at the last minute. “It wasn’t perfect but I'm proud of it. I was there for 12 hours with four other teams who were also part of the Creator Series. Some stayed until midnight, some stayed until the next morning. I finished at midnight,” she recalls. “It worked perfectly 30 minutes before our presentation and then when we got up there, I put it on and it went up to the maximum, so my arm was just like moving around and I was trying to answer questions while my partners were trying to pull out the wires to get it to stop,” Hayam laughs. That prototype was the start of Neuro Amel Technologies, the business that Hayam hopes will bring their automated brace to market. “Neuro is for neuroscience. Amel means ‘hope’ in Arabic. I'm Egyptian and Manar, my cofounder, is Saudi, so we thought we want to keep our Arab roots in it, and so … Amel,” she explains. When Hayam reflects on her university experience so far, she feels fortunate that she’s been able to get involved with such a breadth of programming. Off campus, Hayam has been volunteering as a debating coach at Maritime Muslim Academy. She was part of her high school debating team in Cape Breton and feels it’s a great way to get comfortable with public speaking. That experience has been a benefit during the competitions they’ve been entering to raise the funds required to complete the prototype and launch Neuro Amel Technologies. 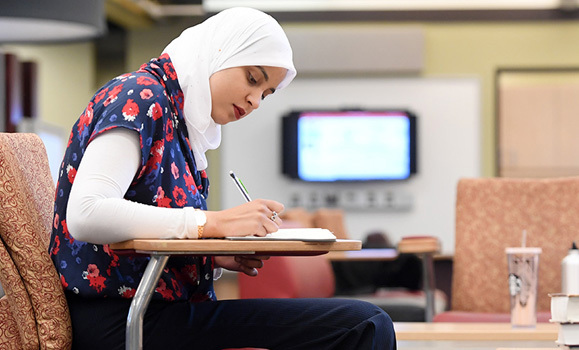 Though Hayam is busy completing her double major and then planning to apply to Medical School, she’s also determined to keep pursuing entrepreneurship.